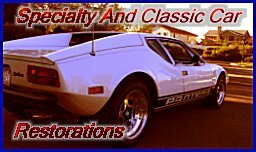 The ZR1 Pantera Project by SACC Restorations | Update: The LS9 is In! Update: The LS9 is In! Our workaround for the throttle body issue is to lower the motor about 2.5 inches to make up for the lack of space behind the firewall. This will provide a few benefits for us: it will lower the center of gravity to provide enhanced handling when cornering & it will allow us to not have to modify the car to allow the pulley’s and throttle body to fit behind the firewall. Update: The LS3 is out! Update: The Engine is Lowered!